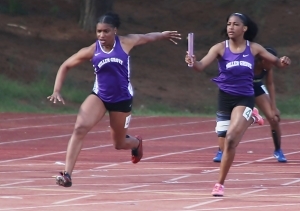 Miller Grove become just the fourth DeKalb County girls’ track team to win three consecutive DeKalb County Track and Field Championships title on Monday at Godfrey Stadium. A strong day on the track with three event wins and four runner-up finishes put the Lady Wolverines over the top with 127 points to 88.33 for Dunwoody in the final standings. Miller Grove joined Southwest DeKalb, Lithonia and Gordon with three consecutive wins. The Lady Wolverines took control of the meet by opening the track finals with a convincing win in the 4×100 meter relay with a time of 46.73 to outpace Martin Luther King Jr. (48.05) by 1.32 seconds to go out in front of then current leader Dunwoody 58-51.33. 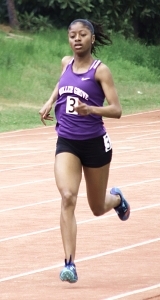 Miller Grove would continue to build its lead as senior Emoni Coleman became an eight-time DeKalb County champion with her four consecutive gold medal in the 800-meter run winning by big 10.15 seconds margin after winning the 1600 meter run for the fourth time on Saturday. Freshman Rasunek Tyler-Thompson got her second gold medal of the meet by taking the 100 meter hurdles title with a time of 14.35 by almost a full second over another freshman in Arabia Mountain’s Candace Taylor. Sophomore Angelica Frederick had a pair of strong second place finishes in the 100 (11.99) and 200 (24.84) meter dashes behind Martin Luther King Jr.s’ Kayla Hunt who doubled up on gold in the events to aid the Lady Lions fourth place finish on the day. Hunt had times of 11.88 in the 100 and 23.38 in the 200 for two gold medals of the meet. Sophomore Faith Hill (45.66) was second to Dunwoody’s Jahvene Walder (44.62) in the 300 meter hurdles and the 4×400 meter relay team took the silver with a time of 3:59.28 behind Southwest DeKalb (3:57.66). Other winners on Monday included Tucker junior Joann Nguyen in the 400 meter dash (58.07) and Lakeside senior Emma Hanson in the 3200 meter run (11:37.11). Dunwoody held a slim lead of 49.33 to 48 over two-time defending champion Miller Grove with Arabia Mountain in third with 26.66 points and Cedar Grove in fourth with 26 after Saturday’s competition. Dunwoody sophomore Janae Profit swept the discus and shot put titles to set the pace for the Lady Wildcats. Profit won the shot put with a new meet record of 41’-11.00” breaking the record set of 41’04.00” set in 1994 by Columbia’s Lesheal Johnson and tied by Southwest DeKalb’s Kenya Wheeler in 2013. Kayla Williams of Miller Grove won the tiebreaker with two-time defending high jump champ Patra Williams of Arabia Mountain with her first attempt at 5’-02.00” in the event. A third gold medal came the way of Miller Grove as Rasunek Tyler-Thompson won the long jump with a leap of 17’-07.00”.